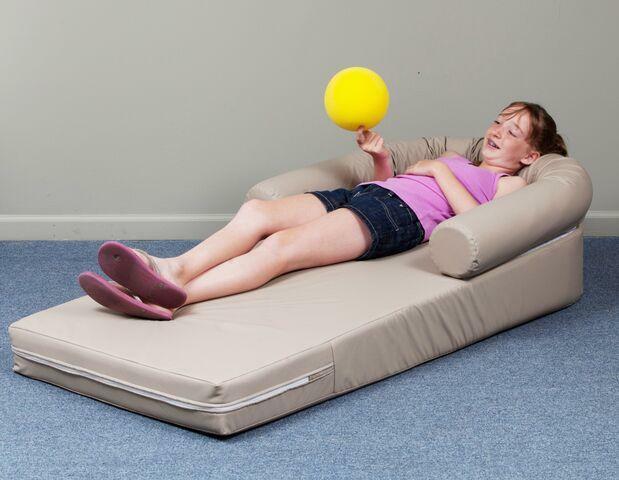 Sturdy but comfortable foam makes this lounger a favorite. The slight elevation of the Long Easy keeps the user engaged in the activity at hand. Excellent for body awareness and stretching out muscles and joints. Easy to wipe clean vinyl. Available in tan. For other colors, please contact customer service for a quote. Made in USA and is CPSIA compliant for lead and phthalates. THIS WILL DROP SHIP FROM THE MANUFACTURER AND TAKE ABOUT 14 BUSINESS DAYS FOR DELIVERY. Dimensions: L: 64" x W: 30" x H: 15"